It’s all happening at Portmeirion on the weekend beginning 14th September. Music, literature, comedy and zorbing – great big balloons as per The Prisoner. As for the festival advert, that’s performed by the Brythoniaid, one of two male voice choirs in Blaenau. Festival details here. Scratching the surface or scratching my head? 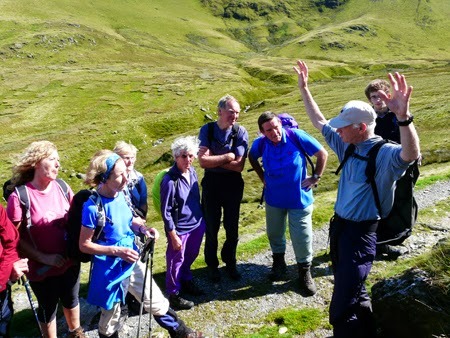 Fourteen of us stepped out of Pen Ceunant Cafe on the slopes of Snowdon for a guided geology walk led by Paul Gannon. I’d read parts of his excellent book, Rock Trails Snowdonia, but I understood more in five hours of walk and talk than any amount of reading. At least I thought I did; the more I try to write it up the more I find I’m scratching my head. Paul gave a quick briefing into the history of the world and how rocks are formed to set the scene. 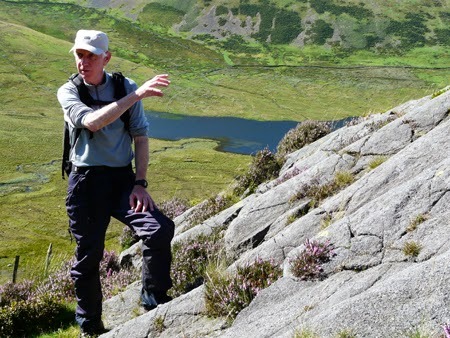 A long long time ago Snowdonia was underwater, on the edge of a continental plate that crashed into an oceanic plate, triggering volcanoes that formed rocks. When our continental plate crashed into another continental plate those rocks were squeezed up into mountains, higher than the Alps but lower than the Himalayas. Since then constant weathering, including many ice ages, has eroded our mountains to a fraction of their former height. Streams were pouring off Snowdon, full from the previous day’s downpours, taking with them tiny particles into the rivers, lakes and sea where they will re-form into sedimentary rock. Smallest fragments convert to mudstone, larger ones to siltstone and even bigger ones to sandstone building up at the rate of 0.1 millimetre a year or 100 metres in a million years. Across the valley was the mayhem of Dinorwig which began as mudstone then morphed into slate through intense pressure from colliding plates. We were introduced to examples of ‘slaty cleavage’ which I think can occur in all (?) sedimentary rock. 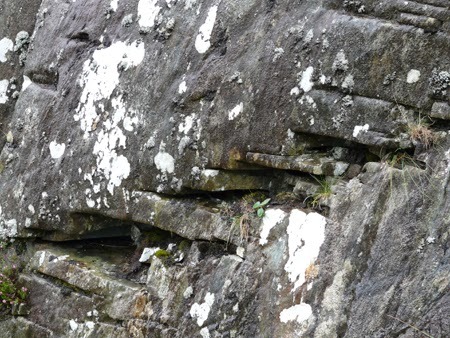 From a vantage point overlooking Nant Peris there was a layer of rock at a 45 degree angle with shelf-like gaps hollowed out of it – this was ‘brittle deformation’ not to be confused with an example of ‘plastic deformation’ a bit higher up. 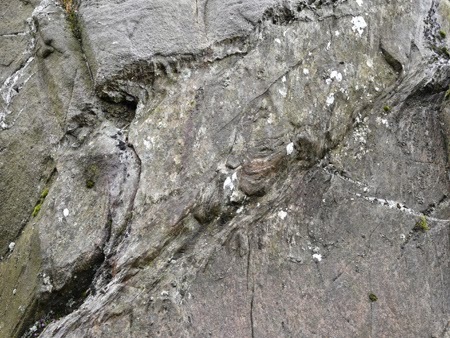 These deformations were caused by plates squeezing layers of rock into folds until they deformed. The plastic one would have occurred when the rock was deeper, maybe 15km inside the earth’s surface, where things are a lot hotter and more malleable or less brittle. We would only be looking into sedimentary rocks on our walk but there was an erratic volcanic rock where erratic means out of place, dumped by a glacier on its way to the sea. 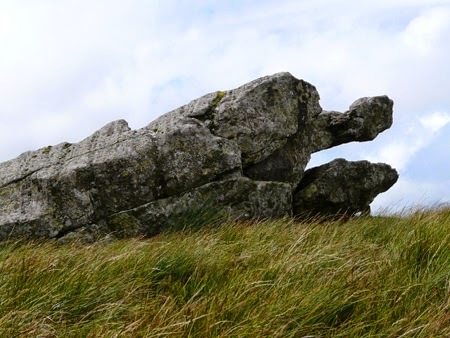 I preferred the erratic dolphin on top of a hill. Walking towards us a visitor had just taken a photo. When asked by Paul whether he’d been photographing a geological feature he replied it was a sheep and came back with us to see what was so special. This was the boundary where Cambrian met Ordovician. On our right towards Llanberis were Cambrian rocks and on out left towards Snowdon were rocks (with slaty cleavage) 50 million years younger. Why the sudden leap? For some reason this part of Snowdonia had been above water for 50 million years so no new rocks were formed until it sank again and sedimentation could continue. Earth slips, glacial cwms, moraines and other geo titbits were pointed out but for me a highlight was the ripples. Sedimentary rock which had been formed into a series of ripples whilst in shallow water with strong currents flowing over – just like the effects of water on sand. 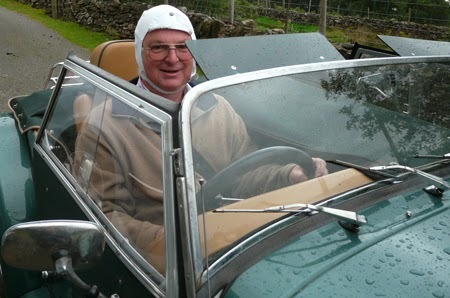 Thank you Paul for your patient and thoughtful explanations and thanks to the Snowdonia Society (in conjunction with Discover Gwynedd) for organising this brilliant event. My head is full of many more questions than I had at the start of the day; time to re-open that excellent book. Mr Redfern arrives at Campbell’s Platform for his Snowdonia holiday. This exceedingly low carbon footprint journey sets the record train time at exactly seven hours from Walthamstow Central. Changes at Euston, Crewe, Llandudno and Blaenau Ffestiniog. 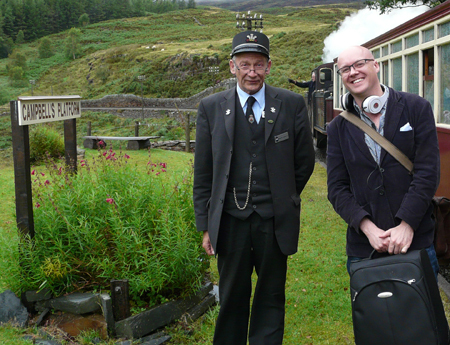 Our good friend Laurence arrived in sunshine, rode the trains, roamed the hills, played on the beach and departed in a rush. Rain clouds moving west to east arrived earlier than forecast and, without the roof, it would be pedal to the floor back to Essex. In case you’re wondering, the purpose of the hat is to avoid sunburn. With sun shine and blue skies I raced through the shopping to be ready for friends staying the weekend. I called by the Purple Moose Brewery to find the shop had moved a door down the street - the old shop being turned into more brewing capacity. I bought some new to me bottles of Ysgawen, a summer beer made with elderflowers. Then to the butcher for Sunday’s salt marsh lamb and that evening’s steaks of black beef. At the supermarket some meringues and whipping cream to go with freshly picked bilberries. The scene was set. Friends arrived. News was exchanged over a cup of tea as peas were shelled from their pods. Lots more chatting with beer as I lit the logs in the Rayburn and prepared the steak supper. Inside the oven some skinny chips, big mushrooms and tomatoes with garlic and pepper. As an afterthought, and a quick rummage in the deep freeze, I threw in a few onion rings. Searing hot griddle pan et voilá, a local feast was on the table. There were compliments to the chef who modestly said it’s all down to the ingredients but apologised for the onion rings which hadn’t quite worked out. Then a few minutes later someone solved the mystery – these onion rings were made of squid. I blame the Ysgawen. By steam from Fairbourne through the SSSI sand dunes to the Barmouth ferry station. Not ‘leaves on the line’ but sand; wind and shifting dunes can quickly cover the tracks. At one stage there’s an 80 yard long tunnel to keep the sand at bay. Butterflies and wild flowers above the shingle overlooking Barmouth then a short voyage across the estuary on the thousand year old ferry service. An adult return, just the price of a cappuccino. Maybe a bit of crabbing, a stroll round the harbour, lunch at Davy Jones’ Locker and a gentle walk back along the railway bridge. A great day out.